From a berth aboard the roomy Moorings 5800 Legacy crewed catamaran in the British Virgin Islands, we discover that the worst hurricane season on record in 2017 can't keep a place this good down. 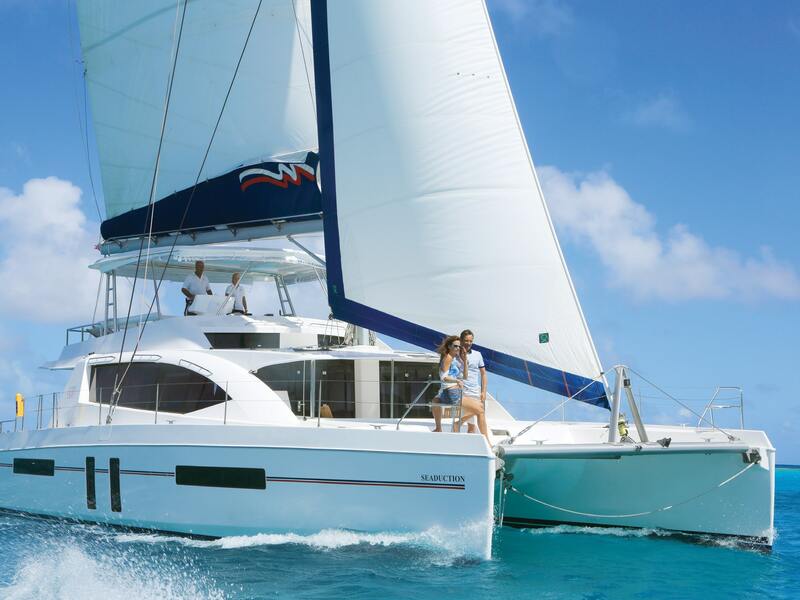 The Moorings 5800 Legacy sails through calm Caribbean waters in the British Virgin Islands. When I first traveled to the British Virgin Islands, it was back in my shoestring, post-college days. With a group of friends, we planned a bareboat charter for a week, crewing and provisioning a sailboat for ourselves. The islands were Oz-like—an emerald string of discovery where hopping from beach bar to snorkeling spot on repeat was our only aim. There was much camaraderie in sleeping under the stars on the deck to escape the nonair-conditioned quarters below and taking Navy showers to save fresh water. But every time I imagined passengers on a crewed yacht, I couldn’t help but envy how the other half sailed. So when I had the chance to return to the islands recently and let someone else do the provisioning and sailing aboard the Prodigious, one of The Moorings’ 5800 Legacy crewed catamarans, I jumped. Slightly east of Puerto Rico, the British Virgin Islands make up the sailing capital of the Caribbean. The area took an unprecedented hit from hurricanes Irma and Maria in 2017, and much of the destruction and recovery efforts are still in plain view. As we sailed out from The Moorings’ base in Tortola, it was impossible to miss the mast of a sunken sailboat sticking out of the water in the harbor and scattered skeletons of downed vessels lining the shore. But the sailing charter business, so vital to the economy, was one of the quickest to bounce back after the hurricanes. I soon discovered that the joy in the British Virgin Islands is still very much in the journey and on the islands themselves. Leisurely snorkeling excursions can be arranged while aboard the Moorings 5800 Legacy. “It’s easy, line-of-sight sailing, a tried-and-true recipe for a good time,” said The Moorings charter captain Martin Street as we left on our six-night charter last June. 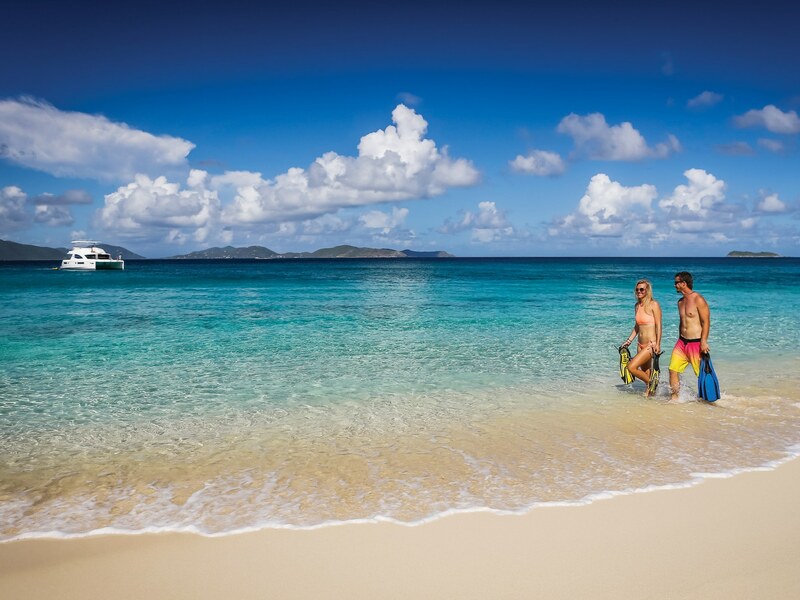 Itineraries are usually pretty straightforward, hitting iconic spots like The Baths, Virgin Gorda and Jost Van Dyke. From a pretrip questionnaire, the Prodigious’ crew (including our captain, chef and steward) had gleaned that our group was into snorkeling and watersports, so every day included a stop or two to swim among parrotfish at submerged pinnacles or launch the stand-up paddleboards and sea kayaks along quiet shoreline. And during one stop arranged just for the scuba divers in our group, the captain met up with a local dive boat so we could explore the area’s famous shipwrecks. Onboard perks include six roomy, air-conditioned cabins for guest use (accommodating a total of 10 guests on crewed sailings and 13 on bareboat charters), including two above deck and four below, each with private bathrooms and showers. And the 5800s are notably the only crewed yachts in The Moorings’ fleet with a dedicated steward on board to cater to your whims at sea and on land. The 5800 is the only crewed yacht in The Moorings’ fleet with a dedicated steward. The greatest luxury, however, comes in dictating your own schedule and rhythm, which might mean asking the captain to change course and linger longer at a particularly lovely harbor or requesting the steward to procure a lobster dinner in a romantic corner of Anegada for a special occasion. Days aboard the Prodigious passed in a blur of placid anchorages, lively beach bars and luminous coral reefs, with breaks for gourmet meals served at a shaded table astern. Lobster rolls, chai French toast and miso-glazed salmon were all on the menu during our charter, but each crew creates unique specialties on the 5800s, and guests can work with the chef in advance to cater to preferences. Evening’s sacred ritual was sunset cocktails served by our steward on the flybridge and rooftop deck, with 360-degree views and plenty of room for everyone to spread out. 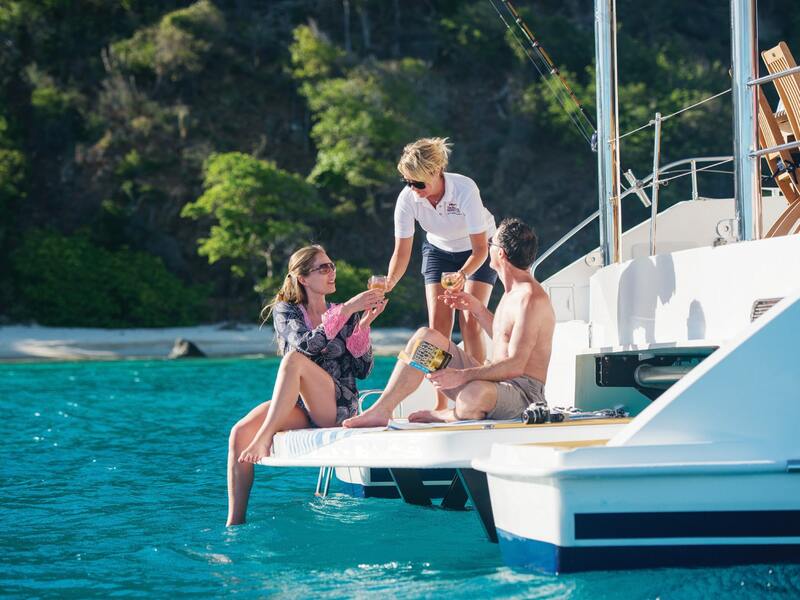 While many land-based accommodations in the British Virgin Islands are being rebuilt, traveling aboard the Moorings 5800 Legacy makes it easy to island hop in comfort and style. Wherever you step ashore, expect to find locals thanking you for visiting.